BRM Mini Cooper 1/24 scale - MARTINI RED #28. 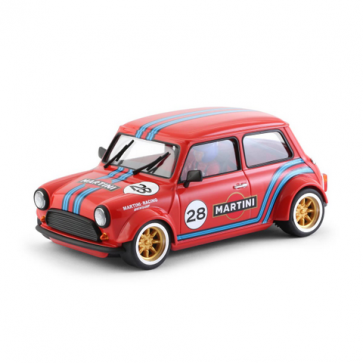 BRM Mini Cooper Gulf Edition No.21 - 1/24th Scale. The iconic Mini Cooper by BRM with some nice features including the innovative rear axle system that allows negative camber on the rear wheels, independently rotated front wheels, anodized aluminium chassis with floating centre piece, aluminium wheels all round and powered by a 19,000rpm motor for excellent driveability. Ready to race out of the box High detail and paint finish. Aluminium front and rear wheels. Innovative rear axle camber system. Compatible for 1/24 and 1/32 track.